There are fully redesigned front and back end changes for WordPress 3.8 over WordPress 3.7. It is now smoother and fully responsive allowing for the finest user experience. for the better experience just download and install WordPress 3.8. 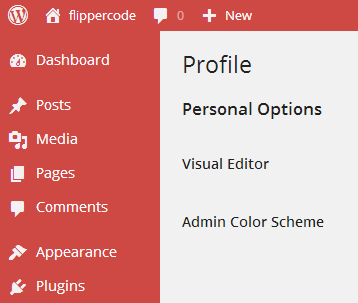 WordPress 3.8 comes with eight new type of Admin color scheme. That makes it more stunning and eye-catching than WordPress 3.7. Like in the above image if we select Sunrise color scheme from admin color scheme then we can see the effect in the given below image. WordPress 3.7 comes with eight widgets that make dashboard to long and confusing than informative, so WordPress did a lot of work in this area. WordPress 3.8 dashboard is simplified and much improved then WordPress 3.7. Eight widgets have become four widgets now. They just removed unwanted widgets and summarize eight widgets into important four widgets. In WordPress 3.7 we can see a lot of text in the theme area. Also, theme thumbnails are smaller in size. On the top, we can see two options Manages Theme and Install themes used to manage and install new themes. In WordPress 3.8 you will see a selection grid displaying your current theme first, and then displaying all other themes you have installed. The thumbnails are bigger in WordPress 3.8, showing you the extra detail of each theme that helps you to find your desired theme. On the top, we can see three options. Search install theme: if you have a number of themes you can search your theme very easily. WordPress 3.7 background of the active plugins was a little changed, so if you were using a number of plugins it could be puzzling for the user to find out which plugin is activated and which is not. But activated plugins in WordPress 3.8 look slightly different. Because In addition to background change you can also see a blue border on the right side of their names, helps you to find the difference between active and inactive plugins from the list. In WordPress 3.7 to activate the widget, we have to drag widgets from available widget to a sidebar. Drag widgets back to the available widget for deactivating them. Widgets you are using displayed in one column. So we have to scroll a lot to reach out the desired widget area. Now there are a lot of changes in the widget area of WordPress 3.8. Now to activate sidebar we just click on it and a new window will open where we can select our desired widget area to make it more simplified. And like 3.7 drag and drop option are still present. Widgets can be seen in the two columns on the left. Two columns scheme helps to find easily to your desired widget area. While WordPress 3.7 does not support any responsive panel. WordPress 3.8 admin panel is now completely responsive. The layout looks great on any device or screen size. This makes easier to blog from your phone or tablet, or even making rapid changes to your website anywhere.